a Distances are given in astronomical units (AU) where one AU is the distance between the Earth and the Sun. the solar system existed, little was known about the nature of these worlds until space probes containing scientific instruments were sent to explore these objects. The Sun fits the definition of a star because it emits its own heat and light through the process of thermonuclear fusion. Planets differ from stars in that they do not emit their own heat and light because they do not have enough mass for fusion to occur in their core. We see planets because they reflect sunlight. Stars and planets are spherical in shape, and are held in that shape by gravity. The planets orbit the Sun in much the same plane, and because of this they all appear to move across the sky through a narrow band called the zodiac. 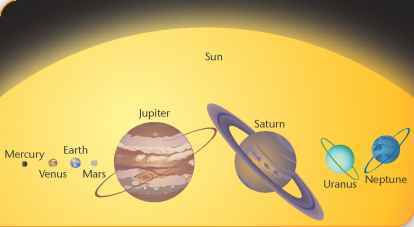 Observed from a position above the Sun's north pole, all the planets orbit the Sun in an anti-clockwise direction. These orbits are often described as elliptical, but for most of the planets these ellipses are close to being circular (Figure 1.5). Eccentricity is a measure of how far an orbit deviates from circularity. The time taken by a planet to orbit the Sun is called its period of revolution and is also the length of its year. A planet's year depends on its distance from the Sun: the further a planet is from the Sun, the slower its speed and the longer its year. Planets also rotate or spin on an axis, which is an invisible line through their centre, from their north pole to their south pole. A planet's rotation period is known as its day. Planets also have varying degrees of axial tilt. Figure 1.6 Axial tilt of each planet (approximate). Axial tilt is the angle between a planet's axis of rotation and the vertical (Figure 1.6). Each planet has its own gravitational field, which pulls objects towards it. Gravitational field strength is measured in newtons per kilogram at the surface of a planet. It takes a lot of energy to overcome gravity and escape from the surface of a planet. The minimum speed that an object (such as a rocket) must attain in order to travel into space from the surface of a planet, moon or other body is called the escape velocity. If the rocket's velocity is too low, gravity will pull it back down. Figure 1.7 The planets in front of a disc of the Sun, with all bodies drawn to the same scale. Planets also have a density, which is a measure of the amount of mass in a given volume. Density is measured in kilograms per cubic metre but is often quoted in grams per cubic centimetre as well. The four 'inner planets' (Mercury, Venus, Earth and Mars) are called terrestrial planets. They are smaller, denser and rockier than the outer 'gas planets' (Jupiter, Saturn, Uranus and Neptune). The inner planets are also warmer, and rotate more slowly than the outer planets. The outer planets are gaseous planets, containing mostly hydrogen and helium with some methane and ammonia. These rapidly rotating planets are cold and icy with deep atmospheres. During the 1800s, astronomers discovered a large number of small, rocky bodies orbiting the Sun between Mars and Jupiter. Bodies such as Ceres, Pallas and Vesta, which had been thought of as small planets for almost half a century, were reclassified with the new designation 'asteroid'. The solar system is thought to have formed about 4.5 billion years ago from a vast cloud of very hot gas and dust called the solar nebula. This cloud of interstellar material began to condense under its own gravitational forces. As a result, density and pressure at the centre of the nebula began to increase, producing a dense core of matter called the protosun. Collisions between the particles in the core caused the temperature to rise deep inside the protosun. 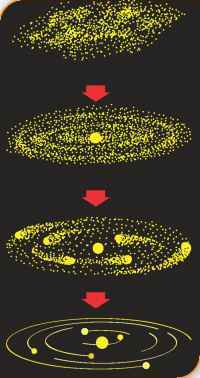 The planets and other bodies in the solar system formed because the solar nebula was rotating. Without rotation, everything in the nebula would have collapsed into the protosun. The rotating material formed a flat disc with a warm centre and cool edges. This explains why nearly all the planets now rotate in the same direction and in much the same plane. Astronomers have found similar discs around other stars. Probing the New Solar System closer to the core. The heavier material condensed to form the inner planets (which are mainly rock containing silicates and metals), while the lighter, gaseous material (methane, ammonia and water) condensed to form the outer planets. Thus a planet's composition depends on what material was available at different locations in the rotating disc and the temperature at each location. (a) A slowly rotating cloud of interstellar gas and dust begins to condense under its own gravity. (b) A central core begins to form a protosun. A flattened disc of gas and dust surrounds the protosun, and begins to rotate and flatten. (c) The planets begin to condense out of the flattened disc as it rotates. (d) The planets have cleared their orbit of debris. The formation of the solar system took millions of years. During this time the temperature and pressure of the protosun continued to increase. Finally the centre of the protosun became hot enough for nuclear fusion reactions to begin, and the Sun was born. Stars like our Sun can take 100 million years to form from a nebula. Data from the oldest radioactive material in our solar system suggests it is about 4.6 billion years old. Much of the debris leftover from the formation of the solar system is in orbit around the Sun in two regions, the asteroid belt and the Kuiper belt. The asteroid belt lies between Mars and Jupiter, while the Kuiper belt is a region beyond Neptune. The asteroid belt contains over a million rocky bodies. About 2000 of these have very elliptical orbits, some of which cross Earth's orbit. Stony fragments ejected during asteroid collisions are called meteoroids. Some of these meteoroids enter the Earth's atmosphere and burn up, releasing light; such bodies are called meteors. Large meteors that impact with the ground form craters like those seen on the surface of the Moon. The Kuiper belt is a bit like the asteroid belt, except that it is much further from the Sun and contains thousands of very cold bodies made of ice and rock. Objects in this outer region take up to 200 years to orbit the Sun. There are other smaller objects on the outer edge of the solar system, in a region called the Oort cloud. This roughly spherical cloud also contains many objects left over from the formation of the solar system. Comets are icy bodies that originate from these outer regions. Many comets have highly elongated orbits that occasionally bring them close to the Sun. When this happens the Sun's radiation vaporises some of comet's icy material, and a long tail is seen extending from the comet's head. 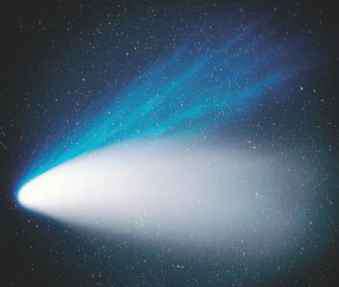 Each time they pass the Sun, comets lose about one per cent of their mass. Thus comets do not last forever. Comets eventually break apart, and their fragments give rise to many of the meteor showers we see from Earth. Exploration of space became a reality on 4 October 1957, when Russia launched Sputnik 1, the first artificial satellite or human-made space probe to orbit Earth. By today's standards, Sputnik 1 was primitive. This satellite was little more than a spherical metal ball with four antennae, a radio transmitter and batteries. It was not equipped to take photographs. It orbited Earth once about every 95 minutes at a speed of 29 000 km/h. Sputnik 1 fell back to Earth on 4 January 1958. 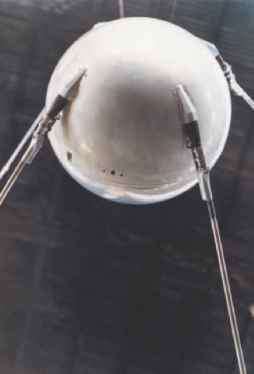 On 3 November 1957, Sputnik 2 was launched. This was a more sophisticated satellite and carried a dog named Laika into orbit. The dog died in space. Russia launched nine much larger Sputniks between November 1957 and March 1961. The Americans entered the space race on 31 January 1958, when they launched a satellite called Explorer 1 into orbit via a US army rocket as part of the Mercury program. On 29 July 1958, America established the National Aeronautics and Space Administration (NASA). The first person to orbit Earth in a spacecraft was Russian Yuri Gagarin, on 12 April 1961. His flight aboard Vostok 1 made one orbit of the Earth. The first American into space was Alan Shepard, on 5 May 1961. Shepard's single-seat capsule, called Freedom 7, made only a 15-minute flight before splashing down into the ocean. It was not until 20 February 1962 that John Glenn became the first US astronaut to complete a full orbit of the Earth. Glenn orbited three times in five hours in his space capsule called Friendship 7. Friendship 7 was also part of the Mercury program, which included six manned flights from 1961 to mid-1963. Mercury spacecraft were tiny and lightweight and could carry only one astronaut at a time; they were intended to test spacecraft technology and the effects of spaceflight on humans. John Glenn, the first US astronaut to orbit Earth, could have been America's first space fatality. During re-entry, the heat shield on Glenn's Friendship 7 capsule became loose. If the shield had fallen away completely, Glenn would have burned like a meteorite as the capsule plunged through the Earth's atmosphere. NASA ordered Glenn to delay releasing a retro-rocket pack attached to the shield. Engineers thought that the pack would help deflect the heat generated during re-entry. They were right, and his capsule splashed down into the ocean safely. Glenn retired in 1964 and became a politician. He was elected to the US Senate in 1974. In 1998, Glenn, aged 77, became the oldest person in space when he flew on the space shuttle Discovery as part of a study on ageing. The first woman into space was Soviet cosmonaut Valentina Tereshkova, on 16 June 1963. Her flight on Vostok 6 lasted almost three full days. The first multi-member spacecraft to orbit Earth was Voskhod 1, launched on 12 October 1964 - this craft contained three Soviet cosmonauts. On 23 March 1965 the NASA spacecraft Gemini 3 carried two US astronauts into orbit. The first person to walk in space was Soviet cosmonaut Alexei Leonov (18 March 1965). Leonov floated around the outside of his spacecraft (Voskhod 2) for 20 minutes, linked by a gold-plated tether. Three months later, on 3 June 1965, US astronaut Edward White stepped out of his Gemini 4 capsule. Between 1964 and 1966, the USA undertook 10 manned flights as part of the Gemini program. The Gemini spacecraft could carry two astronauts and were intended to test spacecraft and equipment that would lead to putting a person on the Moon. On 3 June 1965, US astronaut Edward White became the first American to walk in space. He took his spacewalk during the flight of Gemini 4. White spent 23 minutes floating in space, using a hand-held compressor to manoeuvre himself around. 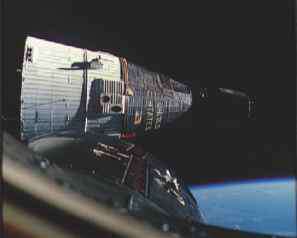 On 16 March 1966, the crew of Gemini 8 performed the world's first successful docking in space, linking their craft with an unmanned orbiting target vehicle. However, this mission also produced America's first real space emergency. Shortly after docking, a thruster jammed and the Gemini spacecraft began to spin violently. Undocking the target vehicle caused the Gemini capsule to spin even faster - 360 degrees every second. The two astronauts on board, Neil Armstrong and Dave Scott, struggled to gain control, and they had to make an emergency landing in the Pacific Ocean. In 1967 the Russians began their Soyuz missions into space. Soyuz spacecraft were designed to carry up to three cosmonauts, however Soyuz 1 only carried one person, Vladimir Komarov, who died when his craft crashed during landing. Many early space probes were directed at the Moon since it was the closest body to Earth and was a relatively easy target. The first spacecraft launched by the USA and aimed at the Moon (Pioneers 0, 1, and 3) failed to reach escape velocity or exploded. In 1959, Luna 1 was launched by the USSR and became the first craft to fly past the Moon - it discovered the solar wind, and is now in solar orbit. America's Pioneer 4 made a distant fly-by of the Moon in 1959. The first spacecraft to strike the Moon's surface was the USSR's Luna 2 in September 1959. In the same year, Luna 3 sent back the first photographs of the far side of the Moon. The first US probe to strike the Moon was Ranger 4, in 1962, but its camera failed to return any pictures. Ranger 5 (October 1962) was to be a lander, but it became a fly-by because of a spacecraft failure. Luna 9 made a soft landing on the Moon on 3 February 1966, and returned the first photographs from the lunar surface, while Zond 5 (USSR) in 1968 was the first probe to orbit the Moon and return to a soft landing on Earth. The USA's Surveyor 5 landed on the Moon and sent back information on the composition of the lunar soil in 1967, while in the same year Surveyor 6 landed on the Moon and successfully took off from the surface. In September 1970, the USSR's Luna 16 became the first probe to return lunar soil samples to Earth. NASA's Apollo program began in 1968 and was designed with the aim of eventually putting a person on the Moon. There were eleven manned Apollo flights, each of which was part of one of the greatest technological achievements by humans. The Apollo spacecraft were lifted into space via Saturn V rockets. Each craft had the general shape of a cone, and they were launched with the narrow end pointing up to reduce air resistance during the flight through the atmosphere. They descended back through the atmosphere with the broad end pointing in the direction of travel to reduce speed and deflect the heat generated on re-entry. Tragedy struck the Apollo program in January 1967, when a fire in their capsule killed the crew of Apollo 1 during a launch rehearsal. As a result Apollos 2 and 3 were cancelled, and missions 4, 5 and 6 were reassigned to automated test launches. The first manned Apollo flight (Apollo 7) occurred on 11 October 1968. During 11 days orbiting Earth, the crew of Apollo 7 tested equipment and manoeuvres. On 21 December that same year, Apollo 8, with astronauts Frank Borman, James Lovell and William Anders on board, orbited the Moon 10 times before returning safely to Earth. In May 1969, the crew of Apollo 10 orbited the Moon and returned to Earth. They tested the lunar landing module, separating it from the command and service module and descending to within 50 000 feet (15 000 m) of the lunar surface. The astronauts took a large number of 70 mm photographs of the lunar surface. The first lunar landing took place on 20 July 1969, when Neil Armstrong, followed by Edwin ('Buzz') Aldrin, walked on the Moon's surface in an area known as the Mare Tranquillitatis (Sea of Tranquillity). Their Apollo 11 mission included Michael Collins, who was aboard the command module that remained in orbit above the Moon's surface. It had taken seven years of intensive planning, four manned test missions, and the combined effort of 400 000 engineers to get a human to the Moon. The astronauts returned to Earth with 21 kilograms of lunar rock material for examination. Apollo 12 was a manned lunar landing that took place on 19 November 1969, in an area known as Oceanus Procellarum (Ocean of Storms). This area was also the landing site for the unmanned Surveyor 3 in 1967. Astronauts Conrad and Bean from Apollo 12 were able to retrieve portions of Surveyor 3, including a camera. Edwin Aldrin, the second astronaut to walk on the Moon, weighed about 70 kg on Earth. His backpack weighed almost as much again, yet on the Moon he weighed only 22 kg. This is because the Moon's gravity is one-sixth that of Earth's. Aldrin felt like he was floating as he walked on the Moon's surface. Each step he took launched him into the air for seconds. To compensate for the mass in his backpack, Aldrin had to lean forward and he found it difficult to tell when he was standing upright. propulsion systems of the command service module. The astronauts had to move into the lunar module in order to survive the return trip to Earth. Astronauts Shepard and Mitchell from Apollo 14 landed on the Moon on 5 February 1971. They collected 42 kg of rock samples from Fra Mauro crater, and used a hand-held cart to transport rocks and equipment. Apollo 14 commander Alan Shepard famously hit two golf balls on the Moon's surface. On 26 July 1971, Apollo 15 became the first mission on which astronauts used a lunar rover (a car-like vehicle) to move around on the Moon's surface. Batteries powered the rover and it ventured 12 km from the main landing craft during a seven-hour drive. It is still on the Moon today. 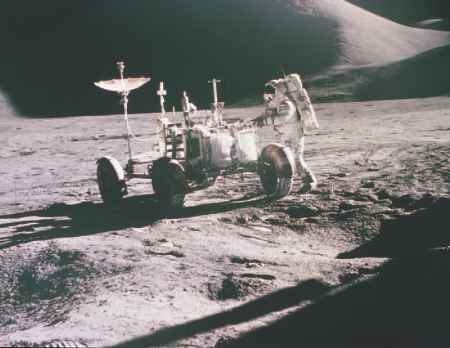 Astronauts on Apollo 16 also used a lunar rover to drive over the lunar surface during a 71-hour stay in 1972. The Apollo Moon program ended in 1972 with Apollo 17. This spacecraft landed near the Descartes crater in the previously unvisited lunar highlands region. 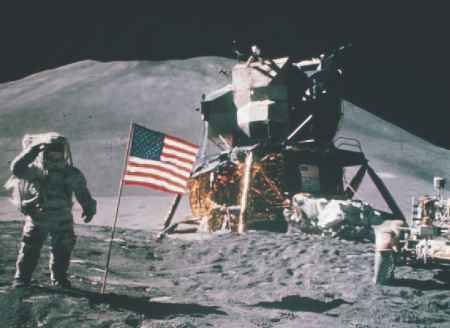 The last Apollo astronaut to walk on the Moon was Eugene Cernan, who saluted the US flag placed in the lunar soil. The Apollo missions ended with 12 astronauts having walked on the Moon, and 382 kilograms of lunar rock being returned to Earth. NASA originally planned 10 Apollo missions, but only six were completed. The last gasps of the Apollo program were the Skylab space station and the Apollo-Soyuz mission (a rendezvous between American and Soviet astronauts in Earth orbit). A space station is a craft that is placed in stable orbit around Earth. Such crafts can be used to monitor space and Earth and provide stop-off points for future manned missions to planets. Russia launched the world's first space station, Salyut 1, in 1971. Salyut was about 15 metres long with three compartments that housed dining and recreational areas, food and water storage, a toilet, control stations, and exercise and scientific equipment. The first crew lived aboard Salyut for 23 days, but were killed during their return to Earth. In subsequent years a total of seven Salyut space stations were placed in orbit. On 2 October 1984, three Soviet cosmonauts returned from Salyut 7 after spending a record 237 days in space. The first US space station to orbit Earth was Skylab, launched in 1973. Skylab was manned by three groups of astronauts during 1973 and 1974. The first crew stayed on Skylab for 28 days, the second crew 59 days, while the third and final crew remained aboard for 84 days. Skylab was used to study the long-term effects of space on astronauts and equipment. Skylab fell from orbit and disintegrated in 1979. Debris was scattered from the south-east Indian Ocean into Western Australia. On 19 February 1986, the Soviet Union launched the 130-tonne space station Mir. This station was designed to be permanently manned. However, with the disintegration of the Soviet Union, Mir became a multinational space station. On 8 January 1994, cosmonaut Valeri Polyakov boarded the Mir space station and stayed until March 1995, a record 439 days - long enough to make a trip to Mars. Australian-born astronaut Andy Thomas spent 141 days aboard Mir in 1998 as part of a series of joint missions between Russia and the USA. Mir orbited the Earth 16 times each day for 15 years. During its life, a total of 108 cosmonauts and astronauts lived on Mir. It proved to be an invaluable resource for technological and psychological research for the future International Space Station. Mir finally splashed down in the Pacific Ocean on 23 March 2001. A space shuttle is a reusable spacecraft that is shaped like an aeroplane. It has three main components: the orbiter, the external fuel tank, and the solid booster rockets. The orbiter is a delta-wing vehicle that carries cargo into orbit. The underside of the orbiter is covered by 23 000 ceramic tiles that protect it from the heat generated during re-entry. The external tank fuels and solid boosters fuel the shuttle engines during launch, and are ejected once the fuel runs out. The cargo bay is large enough to hold large satellites. A robotic arm can lift satellites and equipment in and out of the cargo bay. Once in orbit, the shuttle is manoeuvred by means of two small onboard engines. Upon re-entry into the atmosphere, the shuttle follows a shallow glide path and makes a landing without the need of engines. The main advantage of the shuttle over previously used rockets is that it can be reused, and this helps reduce costs. The world's first reusable manned space vehicle, the space shuttle Columbia, was launched on 12 April 1981. Columbia's commander, John Young, was the first astronaut to have flown six missions - he was on the first Gemini mission in 1965. After a flight of over two days, Columbia landed safely back on land at Edwards Air Force base in the USA. Columbia had orbited Earth 37 times. The shuttle was taken back to the Kennedy Space Flight Centre in Florida riding on the back of a Boeing 747 aeroplane. Challenger exploded 73 seconds after being launched, and all seven astronauts on board were killed. 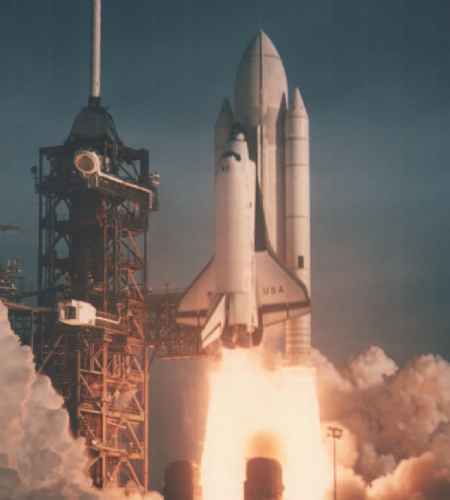 The accident forced engineers to re-design various parts of the shuttle, and further flights were delayed until the launch of Discovery on 29 September 1988. On 1 February 2003, the space shuttle Columbia burnt up on re-entry due to failing heat-shielding tiles. This second shuttle accident resulted in NASA grounding the rest of the fleet. This accident resulted in delays to many NASA projects. To remain in low Earth orbit, a shuttle must travel at about 28 100 km/h. The exact speed depends on the shuttle's mission and orbital altitude, which normally ranges from 304 km to 528 km. The shuttle normally carries between five and seven crew, but can carry up to eight. A Russian space shuttle named Buran made two unmanned orbits of Earth on 15 November 1988, but the project was later abandoned. The European Space Agency planned to build a shuttle named Hermes, but escalating costs forced the project to be abandoned also. The Hubble Space Telescope (HST) was launched from the cargo bay of the shuttle Discovery on 25 April 1990 as a joint venture between NASA and the European Space Agency. The telescope cost $2.5 billion, weighs nearly 12 tonne and orbits 600 km above the Earth at a speed of 28 000 km/h. It consists of a 2.4-metre-diameter mirror mounted in a large tube, three cameras, two spectrographs and a number of guidance sensors. The idea of having a telescope orbiting Earth is to look at objects in the universe without the distorting and obscuring influence of the atmosphere. 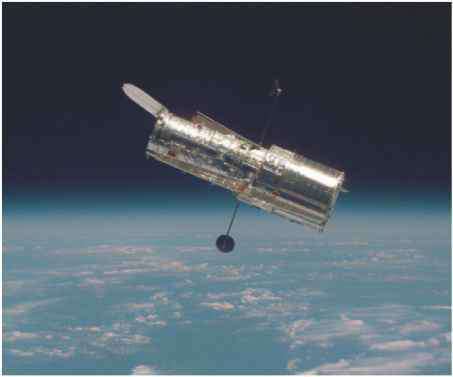 Hubble can detect objects about a billion times fainter than the human eye. Scientists are using the telescope to learn about the nature of stars, planets and black holes, the evolution of the universe, and distant objects never seen before. 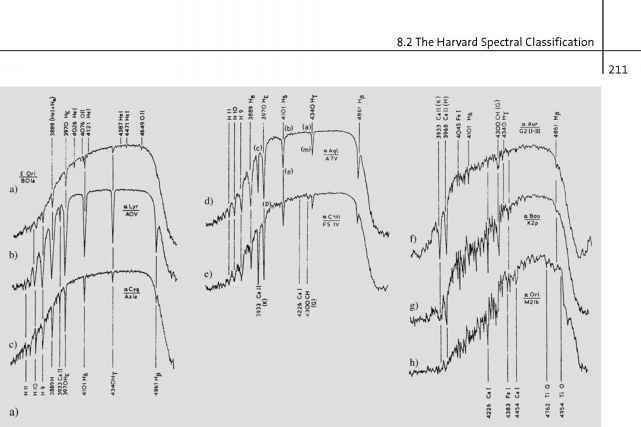 During its lifetime, the HST will study the universe at wavelengths from the infrared through the ultraviolet. 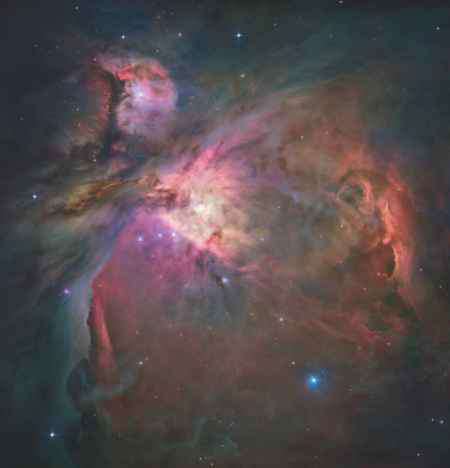 Hubble has been used to view over 10 000 objects throughout the universe. Its high-resolution images of Mars, Jupiter, Saturn and Neptune are providing surprising detail about these planets. The world was amazed in July 1994 when Hubble produced images showing the impact of the comet Shoemaker-Levy 9 with Jupiter. In the Great Nebula in Orion, dusty discs visible around protostars are thought to be new solar systems forming. Discs of matter have been seen swirling around super massive black holes at the centre of galaxies and quasars, as well as structure in the spiral arms of nearby galaxies. Astronomers are already planning the next generation space telescope that will be able to view the universe in even more detail. The Hubble Space Telescope was not an immediate success. The first pictures sent back to Earth were blurred because the telescope's main mirror was not the right shape. Two months after its launch, NASA scientists decided the optics of the telescope needed to be corrected and a space shuttle mission was organised to repair it. In December 1993, astronauts on the shuttle Endeavour worked for six days to repair Hubble so it could see more clearly. The astronauts set new records for spacewalks and the amount of work done while living in space. The corrective optics installed by the astronauts was highly successful and the images are now crystal clear. Two other space observatories orbit Earth, Europe's XMM-Newton and America's Chandra X-ray observatories. Chandra was launched by the shuttle Columbia in July 1999, and is designed to observe X-rays from high-energy sources, such as the remains of exploded stars. X-rays provide scientists with a different perspective when exploring space. The XMM-Newton was launched by rocket in December 1999, and is designed to investigate the origins of the universe by probing cosmic matter from black holes. The elliptical orbits of both observatories takes them from between 7000 and 10 000 kilometres above Earth to more than a third of the way to the Moon. venture between the USA, Russia, Japan, Canada, Brazil, and 15 countries of the European Space Agency. The ISS is more than four times as large as the Russian Mir space station, and has a mass of over 450 tonnes. There are more than 100 components to be assembled in stages, requiring 46 space flights and over 100 spacewalks. The first two sections of the ISS were assembled in 1998 during a 12-day shuttle mission. 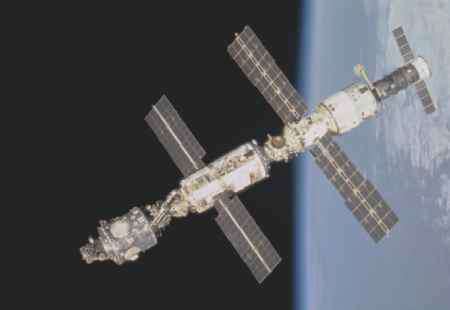 In July 2000, Russia's Zvezda service module was connected to the station. When complete, the ISS will measure 108 m across by 88 m long, with almost half a hectare of solar panels powering its six laboratories. It orbits Earth at an altitude of around 400 kilometres. Teams of up to seven astronauts and scientists will visit the station for periods of up to four months. The ISS will be used to conduct experiments in space that could not be performed on Earth. Research will include studies of protein crystal growth, tissue culture, living in low gravity, behaviour of new materials, space technology and environmental change on Earth. For earth science researchers, the ISS will provide an excellent viewing platform as it crosses over the same area of the planet every three days and covers about 90 per cent of the Earth's surface. A third of the ISS resources will be devoted to commercial enterprises. Many of the research programs planned for the ISS benefit from longer stays in space. • The ISS will be larger than a five-bedroom house. • The ISS will have an internal pressurised volume of about one-and-a-half Boeing 747 aeroplanes. • Fifty-two computers will control the systems on the ISS. • The ISS will be about four times larger than the Russian space station Mir, and about five times as large as the US Skylab. • The electrical system will contain about 13 kilometres of wiring. • The ISS will manage 20 times as many signals as the space shuttle. • The 110 kilowatts of power for the ISS will be supplied by almost half a hectare of solar panels. • The 15-metre-long robotic arm provided by Canada will be able to lift the weight of a space shuttle orbiter. • The station will orbit at an altitude of 400 kilometres. This orbit allows the station to be reached by launch vehicles of all the international partners. • It would take the US space shuttle fleet more than a dozen years and 60 flights to achieve what the ISS can achieve in one year in orbit. the second crew (Expedition 2) arrived at the ISS in March 2001. Jim Voss and Susan Helms worked outside for almost nine hours preparing for the docking of the Italian cargo container, Leonardo. On 28 April 2001, American Dennis Tito became the first space tourist to visit the space station. When complete the ISS will be the third brightest object in the sky after the Sun and Moon. The race to explore space advanced rapidly in the 1960s when the first pioneers of spaceflight where placed in Earth orbit. Since then we have seen advances in space technology through the USA's Mercury, Gemini and Apollo programs, and the Soviet Vostok, Voskhod and Soyuz projects. It was largely as a result of these programs that the first human was able to walk on the Moon in 1969. This was perhaps the most significant step in the exploration of the solar system, since the Moon was the first object outside Earth that humans had ventured onto. Since landing on the Moon, humans have turned their attention to improving methods of space travel and to studying the long-term impact of space travel on humans. As a result of this new focus, space stations like Salyut, Mir, Skylab and ultimately the International Space Station were built. Future manned missions into space will require new technologies and the current space stations are providing a pathway for this to occur.